LaGuardia Community College opened its doors for students in 1971 in an old (barely refurbished) factory building in Long Island City, a neighborhood in western Queens suffering the effects of the deindustrialization that swept the city in those years. Veterans of those early years recall the smell of bread emanating from the giant Silvercup bakery just across the railroad tracks, as well as the smell of chewing gum from the enormous Chiclet factory next door. Founded on the co-principles of cooperative education and intensive courses, LaGuardia was designed to encourage the adult and immigrant populations of Queens, New York to integrate in-the-field experiences with progressive classroom learning. Dr. Joesph Shenker, its founder and first President, embraced the concept of 'one college,' where adult and continuing education courses and community outreach programs through matriculated studies would be equal parts of the mission. This collection, curated by Sandy Watson and Fern Kahn, emphazises the importance of Continuing Education (later Adult and Continuing Education) and contains brochures, photographs, and documents that demonstrate the range of programs and projects that were realized in those years. These programs were aimed at the non-traditional college students who made up a crucial part of the population LaGuardia was designed to serve. 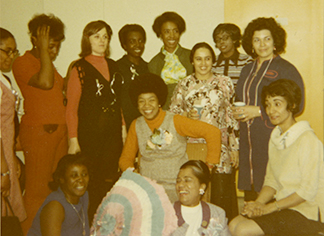 Some programs would become nationwide models, included instruction aimed at working mothers, those learning English for the first time, the homeless, Deaf students, and incarcerated persons. Go to all 28 Items in collection.